At AllWebsites.be, we see websites foremost as a means of communication. It doesn’t matter how fancy you homepage looks, or how hip that new online video is, when your visitors have trouble finding your email address. You might think this is just common sense -and you’d be right- but when we took a look around, we discovered it was hard to find our level of communicational perfection. As a result, we’ll always focus on your message and your audience, not on the fancyness of a page. We’ve seen many websites that actually looked pretty bad, have a much higher turnover than that exorbitantly priced site designed by the hottest new design studio. This philosophy, we take very seriously. Everything else has to suit the communication purpose. For example, we’ll never put up that single amazing picture, if it distracts the visitor from your special offer message. This philosophy yields actual business results. 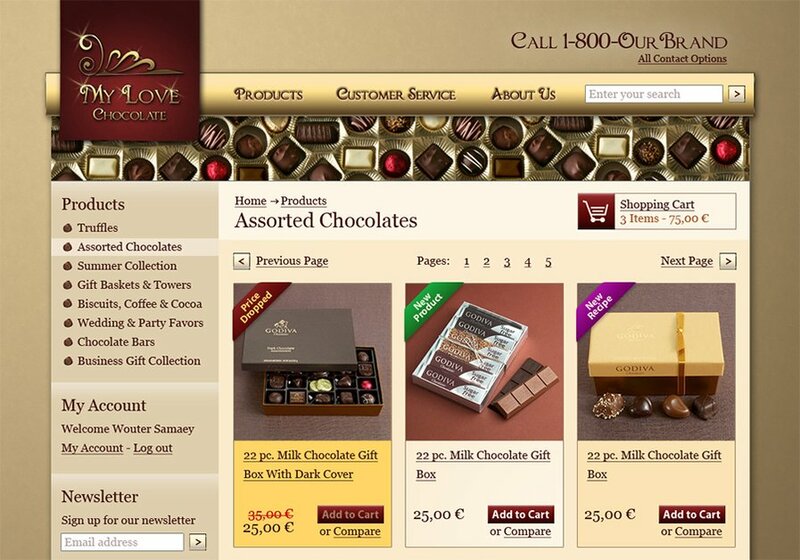 This is a webdesign mockup of an online chocolate shop.